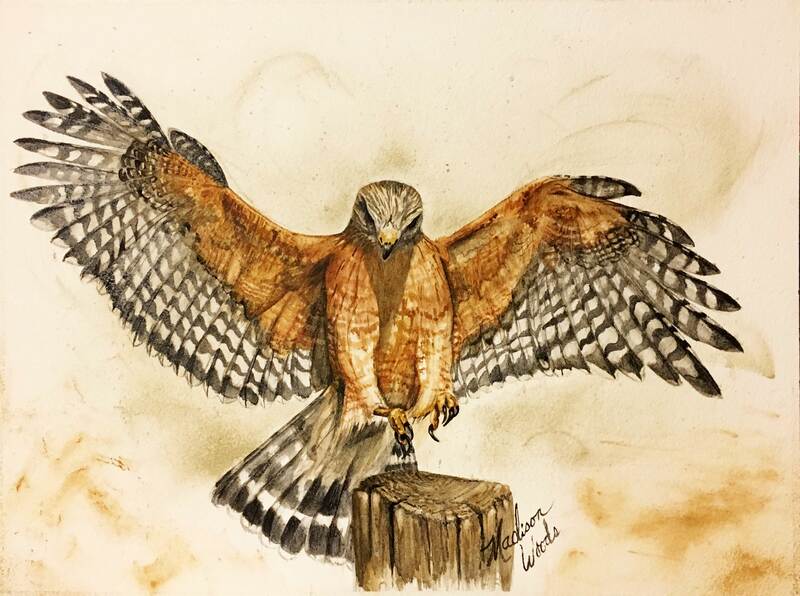 Just finished this red-shouldered hawk (Buteo lineatus). I post all of the steps as I’m doing it at Instagram, so if you want to follow along in real time, follow me there or on FB. Sometimes it’s a good bit later when I get around to updating the website. I decided for this set (I’m doing two of this species) to use the gray-green silt stone for a background. So I went ahead and did both backgrounds at the same time. Here’s the first one with the rough sketch in place. Background and roughed-in sketch in place. There’s always something to correct once the sketch-in begins to take shape. This time it’s the tilt of his head. The angle is wrong and it throws everything else off. The eyes are the first thing I like to do, but I can’t do the eyes until the head is shaped properly. The head is wrong… wrong angles, wrong tilt. I ‘erased’ the lower half of his head by lifting the black paint. Now the tilt is right, and I put the eyes and beak. I will work more on this later, but this is enough for now to allow me to move on. The colors I’ll be using for this hawk are similar to the colors I used on the kestrels and the goshawks. For the goshawks, I used a lot more black, though. I made paints specifically to get ready to do this set of hawks, though, and each set of paints vary depending on the rocks I used to make it. First I added the russet on his chest and wings. Then I added contour lines to his head. Added more shadow to his head, added more pigment to the background. It’s going to be a few days before I get a chance to work on it again now. I had hoped to get both of the red-shouldered hawks done this month, but it seems that life had other plans. February always feels like such a short month, even though it’s only a few days shorter than most. I am going to have to start reducing the amount of other things I commit to if I want to have time to work more on paintings. Update 3/11/19: Finally I’ve had time to get back to work on the red-shouldered hawk. Update 3/19/19: Took me a while, but I’m back to work on the painting. By the end of the day, I ended up one step forward and two steps back. The tail is blocked in better, and so are the feet. But then when I started working on the wings I realized the bars are just too wide on them. So I erased most of them and will start over on that part tomorrow. These are just the place-holders for the feet. I still have a LOT more work to do on them. But they’re in the right place, in the right proportions, and at the right angles. That’s all that matters at this point. Progress on Red-Shouldered Hawk by the end of the day. Most of the bars on the wings are erased (lifted with a clean wet brush). I’ll put them back narrower so it is more accurate. Still working on it… and sometimes I do work on it upside down, lol. But this pic is upside down because I can’t get it to orient right-side-up, even after editing and saving. I’m tired. It’s late. And I’m just going to leave it like this, lol. Not long after I finished this, within a few minutes, a huge crack of thunder rattled the land. The storm had been building all day with my sense of excitement to be nearly finished with this piece. My relief at finishing serendipitously coincided with the start of the storm. It seemed like a good omen. My current project is painting of each of the species of raptors in the Ozarks. Some of them are full-time residents and some just visit. The red-shouldered hawk is one of our resident species. I’ve always been fascinated with birds of prey and the sport of falconry. One of the birds commonly trained for hunting is the Northern Goshawk. Here’s my rendition of a beautiful wild goshawk photographed by Nicoli Gianluca. Right now the image is at the art shop getting scanned because it’s too large a sheet to fit on my own scanner. Once I get the files, I’ll have prints, note cards, and stickers available for it at Etsy. I’ll also have them with me on Saturdays at the Fayetteville (indoor) Farmer’s Market. Unfortunately, the goshawk doesn’t make an appearance often here in the Ozarks. There were a few instances reported of sightings, most likely when one was off course during migration. So I’ve never seen one in real life. I found lots of photos online, but could not reach any of the photographers to get permission. I couldn’t find anyone local who had a good photograph. But Instagram is rich with photographers, and I found Nicoli Gianluca (from Italy) who responded to my permission request. If you are a fan of falconry or bird photography, you can find him as @accipiterhook. The first ‘real’ painting I made was a raptor, and so were the second and third paintings. So I love painting raptors. But after the third Kestrel I decided to try a few different things to see if raptors really are my favorite, or if it’s maybe only kestrels. So I painted a crow, a pelican, and a fox. And I painted a twisted tree. I really liked all of those subjects too, but I missed doing raptors. Now I’m working on a new series of a different raptor, the Northern Goshawk (Accipiter gentilis). I’ve never seen one. But it’s Rob’s favorite. I had thought the kestrel was his favorite, but he’s since said it was a goshawk. So either he has favorite birds like I have favorite colors (can’t pick just one, lol), or he changed his mind. At any rate, I began the first goshawk during the last weeks of 2018. It presented new challenges. Not only is it a different bird in appearances, but it’s a different size. This canvas is much larger than my previous largest thing ever painted. It’s 12″ x 18″. I had put off starting it because the size intimidated me. There’s so much more room for mistakes! Maybe that’s not true, but there’s more room to *see* the mistakes is closer to an accurate statement. It was the most difficult thing I’ve painted yet. For this one I wanted to do something different than with the previous paintings. I like the rubbed and speckled backgrounds of the others, but I wanted *more* this time. But I didn’t know exactly what I wanted. And then, too, again being a larger canvas made me reticent to start on top of not knowing exactly where or how to start. So I decided to just paint something. A rather barren landscape in brown sandstone, with a rub and speckle before using a wet brush. I like the mist flowing into the scene. That background started out as a random painting with no image in mind. Once it began to look like hills, I added the mist. Or rather I subtracted it. I decided I rather liked it and decided to use this as the backdrop for my Goshawk No. 1. Note added: Now that I’m nearly done with the painting, I think I’ll go back to my original type of background. I am not loving this washed out landscape much. The goshawk is traced in with one of the colors that shouldn’t interfere with final pic. Before I can go any further with it now, I have to fix the eye. After the outline, the eye is the part that holds everything else up. It doesn’t have to be perfect, just good enough. This is good enough for now. At least the shape and size is right. It’ll take on more character after I get more of the surroundings done. Usually, I am adding too much black and have to take a lot of it back off. In this case, I’m finding it hard to add *enough* black. Part of that is due to the size of the canvas. It is physically a lot more paint than I’m accustomed to using. The other part is that this bird has a lot more black. The beak on this painting gave me LOTS of grief! I had to rework it several times until I was happy enough to leave it alone. During the effort of getting the beak right, I found that I hate this paper I’m using. It didn’t hold up well to lifting the color repeatedly and repainting, so I ordered some heavyweight paper from Arches to try. I’ve heard it’s the best. We’ll see if it holds up to my technique, lol. Erased the goshawk beak and re-did more than once to get it right.